Born Anna Marie Wooldridge in Chicago, Illinois on August 6, 1930, and raised on a farm in Calvin Center, Cass County, Michigan, Abbey Lincoln (stage name) was an African-American jazz singer, songwriter, actress, and civil rightsactivist. The tenth out of twelve children, she began her singing career at a young age, performing in school and church choirs. At 19, Lincoln won her first amateur concert. When she was 22 years old, Lincoln moved to California and then spent a year in Honolulu, Hawaii, as a singer at a nightclub with the stage name Gaby Lee. She moved back to California where she met Bob Russell, lyricist, who became her manager and gave her the stage name Abbey Lincoln. After living in California for many years, Lincoln moved back to Chicago as her singing career was beginning to take off. She landed a role as a singer in the 1956 film The Girl Can’t Help It. After the film, Lincoln fired her manager and became a recording artist. Lincoln recorded her first album, Abbey Lincoln’s Affair: A Story of a Girl in Love, in 1955. She moved to New York City, New York in 1957 to pursue her music career by working at the Village Vanguard, a jazz club in Greenwich Village, New York. While performing there she met Max Roach, a drummer, composer, and bebop creator whom she would eventually marry. Roach played a large role in her civil rights activism in the 1960s. She, her husband, and other artists performed at benefits and fundraisers for the National Association for the Advancement of Colored People (NAACP) and the Congress of Racial Equality (CORE), among other civil rights groups. Lincoln’s music began to reflect injustices blacks experienced in America in albums like We Insist! Freedom Now Suite and Straight Ahead. Lincoln played roles in the 1964 film Nothing But a Man and For the Love of Ivy in 1968.By the end of the 1960s, however, Lincoln and Roach divorced, and she moved back to California, where she became immersed in art. In the 1970s and 1980s, Lincoln recorded songs for Inner City and Enja, small independent record labels. In 1989, Lincoln was invited by Frenchproducer Jean-Philippe Allard to record for Verve Records/ France, giving a major boost to her career. In 1990, Lincoln’s album, The World Is Falling Down, propelled her back into fame in her sixties. She continued to record philosophical CDs for Verve, which brought her continuous success. In 2003, Lincoln received the National Endowment for the Arts NEA Jazz Masters Award. Her last album, Abbey Sings Abbey, was recorded in 2007. She died on August 14, 2010 at the age of 80 in her Upper West Side apartment in Manhattan, New York. Abbey Lincoln was called the last of the great jazz singers. 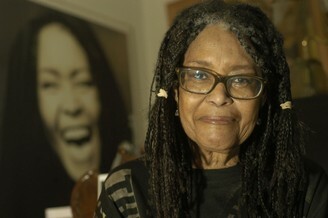 “Abbey Lincoln Obituary” by John Fordham, The Guardian, Aug. 15, 2010, https://www.theguardian.com/music/2010/aug/15/abbey-lincoln-obituary; “Abbey Lincoln,” Verve, The Verve Music Group, n.d., https://web.archive.org/web/20070517132240/http://www.vervemusicgroup.com/artist.aspx?aid=2854; “Jazz Profilesfrom NPR Abbey Lincoln” by Sally Placksin, National Public Radio (NPR), n.d., https://www.npr.org/programs/jazzprofiles/archive/lincoln.html.